Parents and children go to Riverside's Cellar Door bookstore to hear book read by drag queens, but one woman called it a "perversion" and began recording. Tony Shin reports for tthe NBC4 News at 5 Tuesday, Oct. 30, 2018. 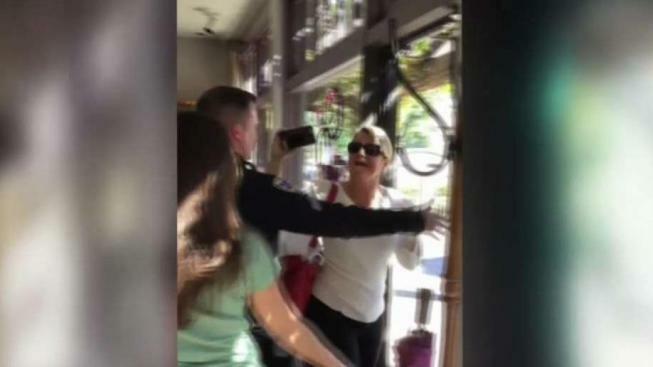 Story time at Cellar Door bookstore in Riverside turned into a confrontation between a parent and the store owner and it was all caught on camera. Cellar Door bookstore was hosting a story time event in which Halloween books were read by three drag queens. “A lot of indie bookstores are doing drag queen story time,” said Linda Sherman-Nurick, a owner of the bookstore. But it was clear that not everyone liked the idea. Sherman-Nurick said in the days leading to the reading, she had been getting angry phone calls from people saying they shouldn’t host that event. “Our response was 'that’s fine, don’t come',” she said. During the event, Sherman-Nurick noticed a woman recording video and she explained to her that she couldn’t record kids without the parents’ permission. But the woman refused to stop. Some parents ask Peters to leave due to small children watching, but even after security guards step in, she refuses. Peters said she wasn’t recording the children, just the drag queens and explains that she decided to attend the reading because she feels that the country is going down an immoral path. “For the last 30 years, the homosexual agenda has been first and foremost wanting to desensitize our communities, our children, our families,” she said. Drag queen performer Jovani Morales said he’s not surprised by the comments. Eventually, a Riverside Police officer escorted Peters outside the bookstore, but she said if they bring the drag queens back, she will also be back.